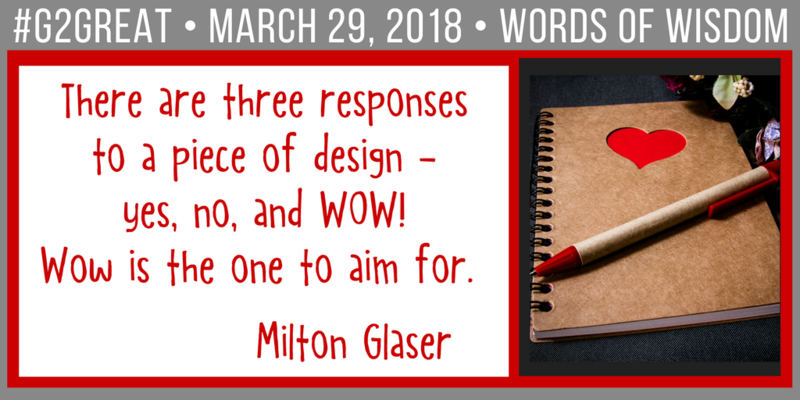 On March 29, 2018 #G2Great settled in to initiate an important conversation as we explored the topic, Instructional Design with Students in Mind. 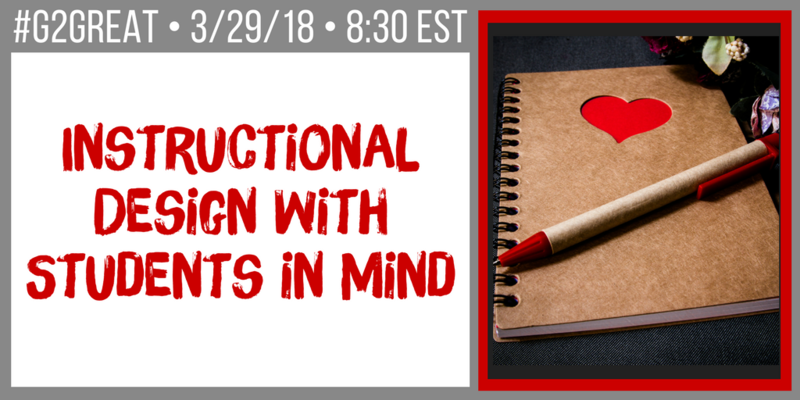 Teaching with “students in mind” has been a recurrent #G2Great theme since your chat co-moderators (Mary, Fran, Jenn, Amy) believe deeply that effective teaching is student-centered rather than publisher or teacher-driven. Over the past three years, we have celebrated this theme even if the words students in mind didn’t appear in the title. This week, our dialogue focused on varied instructional design areas that include read-aloud, conferring and small groups; the impact of workshop model; and the role of productive struggle, predictable structures and transfer. As I looked back at the inspired tweets that rose from our chat discussion, I was immediately struck by the interconnectedness of these components that help us to keep students at the center of those practices. Based on this observation, I realized that it made sense to focus this post on that interconnectedness. Instruction cannot occur in a vacuum where each component is considered in isolation but how those components can work in tandem. In other words, powerful “pieces” of instructional design combine seamlessly across every learning day as they begin to intersect into a proverbial instructional puzzle that is much bigger and far more powerful than those “pieces” could be on their own. I am convinced that our ability to create an instructional design with students in mind will require us to explore that design from a global instructional perspective. The source of our commitment and a central feature of this discussion was clearly the idea of falling in love with reading and writing through daily engagement designed to increase volume. We understand that keeping students at the center assumes that we are able to address both the instructional and emotional needs of our learners. This design theme is purposefully placed in the first position as 0ur willingness to celebrate or ignore this theme can dramatically impact student learning for better or for worse. Instilling lifelong love of literacy and maximizing the critical role of volume is central to our student-centered design theme. In an age where scripted programs continue to spread like a virus across our schools, it is more important than ever for us to remain steadfastly responsive to the unique needs of students. These programs are riddled with preconceived questions that come with predetermined answers, thus putting the program at the center while crowding children out of their rightful place. When we generate more questions than we ask and create opportunities that respect student thinking in the context of learning, we make a much-needed shift from program or teacher-driven instructional design to a focus on student-centered learning. Another important theme explore teachers’ role as dedicated professional noticers. As teachers who are thoughtful and curious about children, we know that we must pause within the learning moments. These moments give us time to step inside the learning process so that we can gaze upon and ponder what we see and hear and what that means. Through these reflective wonderings, new possibilities begin to come into view and help us to consider next step opportunities. This continuous cycle allows us to move seamlessly between a fluctuating role as teacher and learner so that we can happily follow a curiosity-inspired trail to greater understandings. As we become more curiosity-inspired, we begin to recognize the impact of our practices when we embrace an invitational spirit. This happens when we are able to let go of the ineffective notion of the teacher as leader at the helm of the ship so that we can step aside as students to assume the lead role. We acknowledge that in doing so we are also inviting students to wade in the productive struggle pool of potential, knowing that they will emerge victorious and better for it as we wait in the wings to offer feedback, encouragement and carefully timed support that does not rob them of opportunities to linger at the thinking helm without us. As we begin to relinquish our own responsibility in order to give students increasing ownership of this process, we must also learn to change our mindset by assuming a flexible stance. We acknowledge that flexibility comes with great rewards and so we are willing to let go to contemplate the opportunities that rise from this flexibility. This shift to a broader view of options can come with uncertainty that allows us to expect the unexpected and notice wonderful surprises that come our way as a result. This does not mean that we do not have a map to guide us, but that we are willing to meander our way to new pathways informed by students engaged in the messy process of learning. Across the chat, the idea of being intentional in our efforts to keep students at the center of all we do was celebrated. While intentionality was peppered across each of the chat questions, this topic almost always took us full circle to how we could use this new view to promote transfer of learning. Intentionality is not a passive process but one that requires us to be professionally purposeful as we recognize that transfer is the gold standard of all we do. Without transfer, “learning” will remain forever just out of reach, so we keep this ultimate goal in our sights at all times. In this way, we ensure that learning will not be stuck in a single teaching experience but will live on through exposure within varied contexts. It seems appropriate that our last design theme brings us full circle back to the first one and is the thread that is interwoven across the other five. Our commitment to love of reading and volume bring us back to joyful and magical learning that merge into synonymous understandings. It was clear from the beginning to the end of the chat that our efforts to keep students at the center of learning always comes back to our desire to motivate, inspire, engage and beckon our children into joyful literacy. We agreed that magical book experiences were the main ingredient of that joy and recognized that our ability to approach learning with a celebratory lens focused squarely on our learners was critical to the joy process from both a teaching and learning perspective. And though this perspective we can enrich and elevate our ability to keep students in mind. The dedication of the professional family that Fran, Amy, Jenn and I have worked tirelessly to gather together every Thursday night on #G2Great is a testament to our recurring theme of keeping students in mind in every aspects of instruction. Our incredible collaborative learners do not gather on #G2Great in a quest for one-size-fits all narrow activities. Rather, they gather to engage in a shared learning that will inspire each of us to become our best selves so our students can become their best selves. This is the heart and soul of our goal to keep students in mind. The dialogue that lifts #G2Great into Twitter trending each week reflects the student-centered devotion that our #G2Great educators bring gloriously to life in classrooms across the country. And we are honored to celebrate the heartbeat of those conversations!